7th Jim and I found an enormous pile of ragwort and brash at the burning site. A brisk wind helped us to get a fire going with cardboard, shredded paper and old tree stakes, which had been removed from the Flashes. It was burning well enough not to be affected by the mid-morning downpour, although the same could not be said for us. We kept it lit over lunch by adding old fence posts. 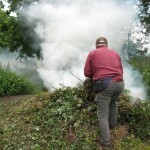 Adding ragwort produced a very smoky bonfire. We left it smouldering when we went for a cup of tea, only to be greeted by complaints about our body odour. 13th Jim and I returned to the remains of last week’s bonfire with matches, newspaper, cardboard and any scraps of timber that we could find in the yard. There was hardly a breath of wind, but one match was all that it took to get it going again. We piled on the brash that Chris had delivered at the end of last week. 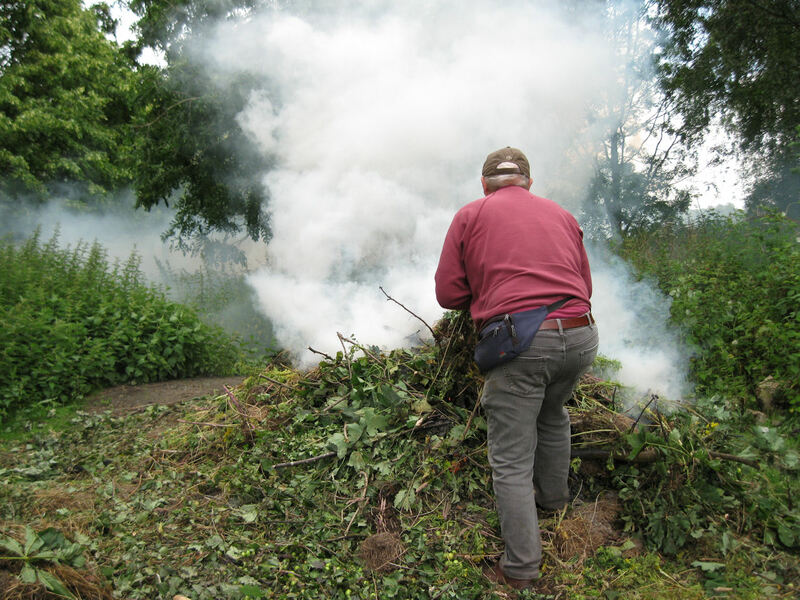 Once the heat had built up, we were able to burn the last of the ragwort to prevent it seeding all over the park. That was the morning accounted for. The delight in store for the afternoon was ragwort pulling. Six of us walked, whilst another four travelled with Chris, collecting ragwort along the scenic route to the Scrape Meadow. Much of what goes under the general term of soil there is more akin to concrete, so some of the ragwort was cemented in the ground and only got topped, not pulled. 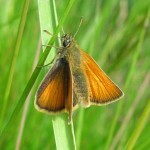 In the lovely sunshine there were more butterflies than we’ve seen for a while and I took a break from the thirsty work to practise my ID skills. We thought that we’d finished when we couldn’t see any more of the ragged yellow flowers, but Chris had other plans for us on Dairy House Meadows. We peered over the gate and the cattle came to greet us. 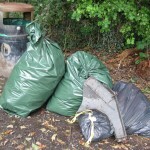 Chris conjured up more green plastic sacks and we spread across the field in search of ragwort. We didn’t have to look too hard, but the weed wasn’t as prolific as last year. It seemed a long way walking back to the cabin. 20th Jim and I had noticed the amount of litter in Band Shed Wood and offered to come back and have a tidy up. Once we climbed up the banks away from the main path we found the remnants of picnics, parties and a bonfire. We’d brought a couple of sacks with us, little realising that two sacks would not be enough. 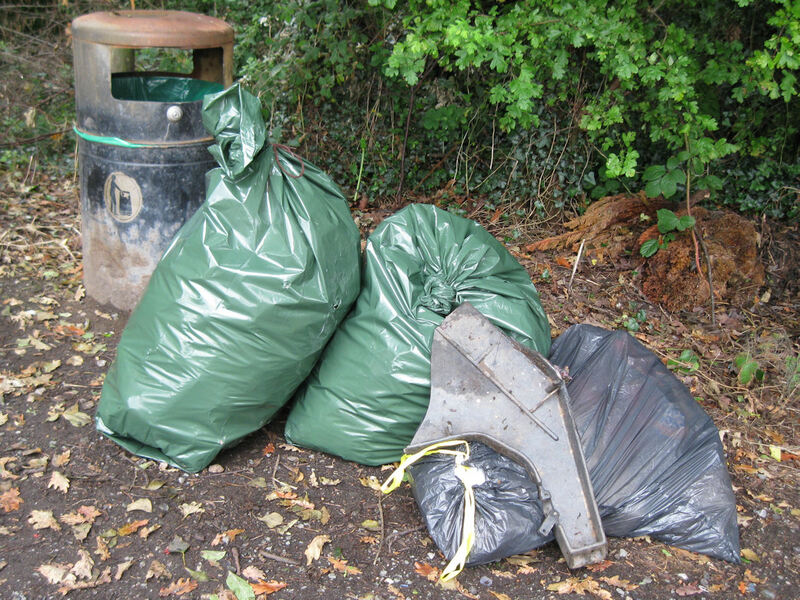 Luckily we had one of our own relatively flimsy black bin liners in the car, so we could complete the clear up and leave a neat stack for later collection. 21st Everyone in the yard helped to load up the trailer with sacks of ragwort and used timber destined for a bonfire. Jim, Elna and I arrived at the burning site first, only to find that there were already huge piles of ragwort, which had been dumped earlier. Amanda brought Alan in the van to help us empty the trailer and join in our bonfire party. There was very little wind, but it was dry and bright. We soon had enough heat to begin gradually adding the ragwort. With everything burning well, Elna and I took advantage of the first and last decent day of the Butterfly Week, which runs from Friday to Thursday this year. We were optimistic, but sightings were very patchy. 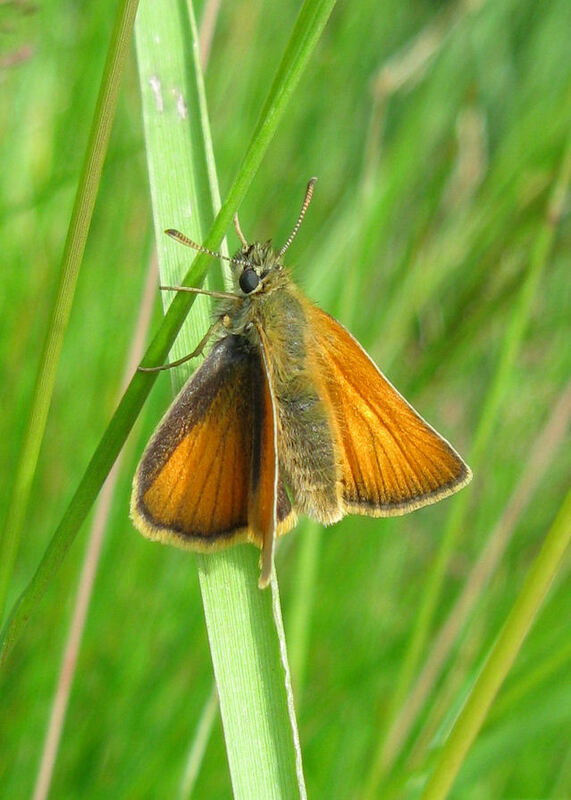 The predominant species were small whites and gatekeepers.